After ten shows at our original club venue, Jack is venturing out into the wild. 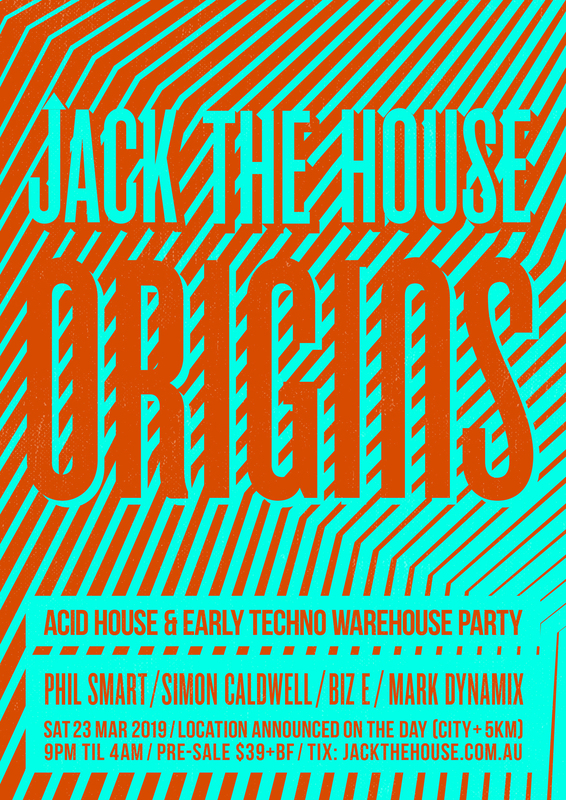 Jack The House: ORIGINS headlines the pioneers from the golden era of house and techno in Sydney. 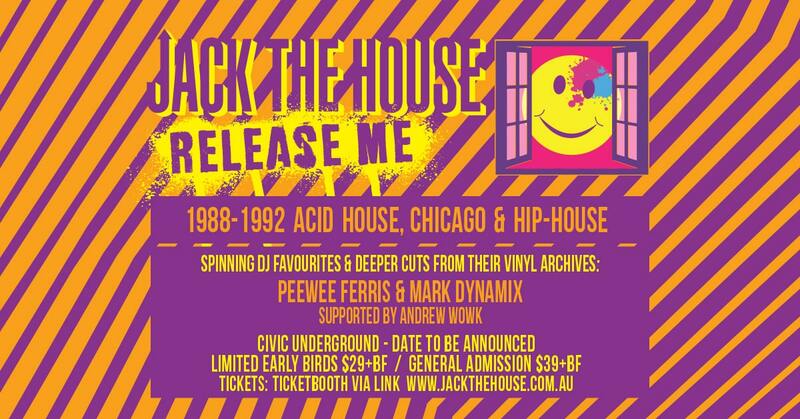 It's a rare treat to hear Phil, Simon and Biz pull out their favourites pre-1995 and for this Jack The House, expect those classic acid house & early techno records that shaped the dance music of today. Phil has played music for people in clubs, bars, warehouses, fields, forests, deserts, basements, car parks and bunkers around the world for more than twenty five years. He was voted Australian DJ of the Year at the DMA's and twice voted into DJ Magazine's prestigious list of the world's Top 100 DJs. Continuing to be a major influence in 2019, Phil shoots up and down the east coast continuously, playing S.A.S.H, Subsonic, Mad Racket, Revolver, Falls Festival & Splendour in the Grass. Simon keeps himself free to draw on his varied loves of deep, soulful house, techno, funk, jazz, electro, booty, hip hop and anything else which catches his ear. A DJ since the early 90’s and as resident/co-promoter of the Sydney institution that is Mad Racket, he’s responsible for keeping Sydney well-versed in underground house and deep flavours. Biz-E (or just Tha Biz as he's affectionately known) is truly one of Australia's pioneer techno DJs and Pete has been a key player since the mid eighties. He has a deep passion for the artform and as a producer, his records have been charted by the likes of Dave Clarke, Ben Sims and Derrick May; which is testiment to the quality of his production work. Fresh from just being signed to Detroit's Transmat label, Biz will take the genre by the horns and dish up those meaty tracks that kicked off 90's techno. Jack The House founder Mark Dynamix (S.A.S.H, Cafe Del Mar, Electronique) will support our special guests on the night with a selection of vinyl that stands up as the best examples of music from that early period. We highly recommend you purchase tickets online as we can not guarantee tix on door. 18+ Event. Valid Photo ID required on entry. Friendly security on site. Chillout area. No lockouts but we ask you to stay inside the venue if possible, to reduce noise. B.Y.O OK - no bar on site due to licensing. Venue Location: This will be emailed to you on the day of the event using the email address you register when purchasing tickets. Subscribed members of the Facebook Jack The House page can also check the event on the day @ www.facebook.com/groups/jackthehouse Subscribe for free now if you haven't already.